Top knots are our favorite go-to hairstyle on days when we don’t have time to go the heated styling route. The style is also helpful when you want to hide the fact that you haven’t washed your hair in, oh, a week. 1. Flip your hair upside down when gathering hair into the ponytail. This will help you to get it as high as possible. 2. Once you’ve gathered the hair, flip upright and look up to the ceiling, so your head is tilted, which will make smoothing the hair into place that much easier. Once your ponytail is secured, wrap the hair around the base and secure with four to five large bobby pins. The result? A fuss-free hairstyle that will stay in place all day. It’s our 3rd annual Black Friday Sale! HUGE discounts on our Beautiful Indian Hair. Save $30 on all orders over $200 on non-sale items!!!! 12″ Indian Hair as low as $60! 14″ Indian Hair as low as $70! 16″ Indian Hair as low as $80! 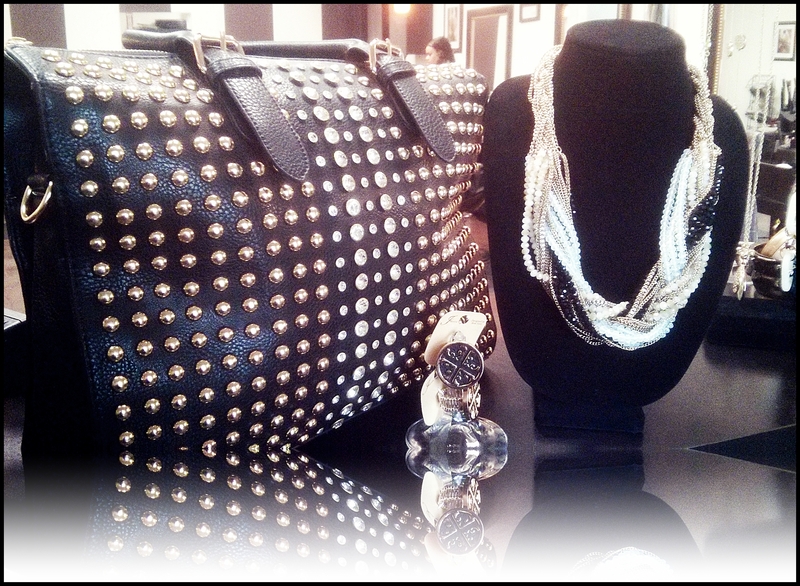 Just received a new stock of purses and bling! Come by and enjoy this amazing view with everyone here at Tiffany’s Hair Studio. One of my favorite things when going out is getting my hair done. Whether it’s a simple braid, a lazy bun, a sleek ponytail or just let down straight, hairstyling is a very important piece of an entire look. However, there are those days when the hair looks perfect, and the minute you go out, the weather just ruins it. It happens to all of us, having an irrational fear of rain during a good hair day. For that reason, I’ve found some simple tips that will help your hair maintain a good texture and look, and not be affected by an unpredictable weather. – Apply heat protectant and anti-frizz serum while your hair is still damp, which will help avoid frizz and split ends caused by humidity. – Keep your hands off your head. Touching your hair constantly will only cause frizz and make it look oily and greasy, besides ruining what took you too long to style. – When blow drying, make sure your hair is 100% dry. Leaving a few sections damp will cause a major frizz disaster. And, after completely blow drying, wait a few minutes for the hair to cool down before applying hair spray or any other product. – For me, during a rainy day, braiding is the best option. Grabbing all of your hair into a pretty braid will keep it from getting big and dull. A messy bun works wonders as well. – As obvious as it may sound, use an umbrella. Wearing a hat or hood will only mess with your hairstyle and somehow ruin it, so for a really rainy day, an umbrella is the way to go. Any other good tips for rainy weather? Welcome to Tiffany’s Hair Studio’s very first Blog! We cant wait to share beauty tips and news with you all. Have a wonderful day and stay tuned.